think the traffic is bad now? Another huge concrete box will be up for a use permit before the County Planning Commission on July 18th, 2018. The Nova Wine Warehouse will add 400,500 sf of space, 263 parking spaces, 80 loading bays 20-40 more employees to the congestion in this already badly congestion location. This follows the proposal down the road of another similar sized warehouse project which, unlike this one, went through the EIR process ending with a liftiny of significant and unavoidable traffic and cancer causing impacts. Will this project, and every project proposed in these two industrial zones, do anything but add to those significant and unavoidable impacts? As the EIR pointed out, there are no traffic fixes on the horizon. 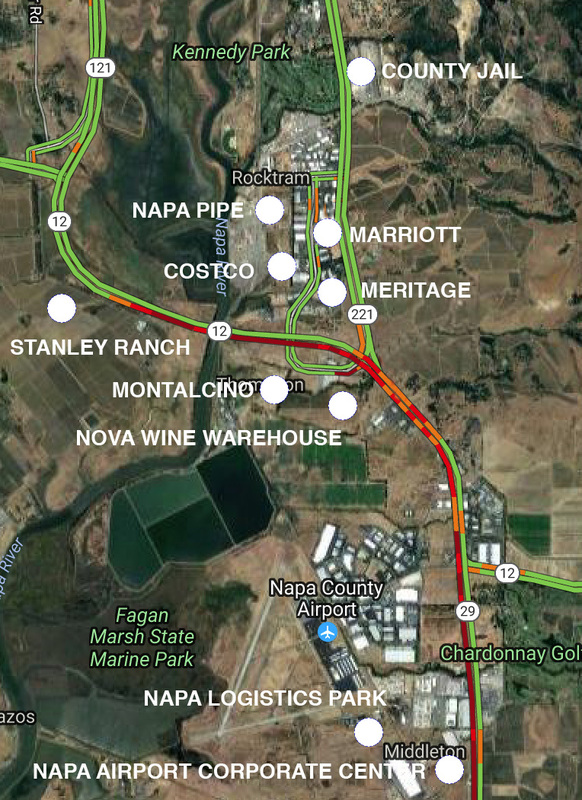 There seems to be no end to the desire to link the urban sprawl of Napa with that of American Canyon to bring traffic in this bottleneck to a complete standstill while making the grand entry to the fabled Napa Valley as charming as a traffic jam on I-80 through Oakland. In an abstract effort to concentrate urban development lust in the south county, the ultimate buildout of American Canyon and of these industrial areas have never been considered from a regional traffic standpoint. Once the traffic is bad enough, the thinking seems to be, someone will build some flyovers, or freeways or something. NVTA, responsible for transportation projects in the south county, doesn't see that happening. As an aside, in this case the project will fill in the lowlands surrounding the historic and bucolic Rocca Winery and tasting room, destroying their isolation and bringing noise and cancerous pollution from the vehicles looping around their property each day. A parking lot and blank wall of the project push up against and ignore the wooded meander of Soscol creek. This is not the 19th century. Creeks should be planned for human enjoyment, not left to become the forgotten back alleys of industrial operations. In approving the Napa Airport Corporate Center, the AM Can Planning Commission adds 4900 more vehicle trips per day plus an increased risk for cancer. More Here. The Trinitas Mixed Use (Marriott Hotel-Winery-Office Bldg) complex is up before the Airport Land Use Commission (County Planning Commission + 2) on June 6, 2018. It is a 253 room hotel, 25,000 sf winery (no capacity or visitation specified but 57 parking spaces allowed), 30,000 sf office bldg, and 441 total parking spaces. Is it compatible next to the airport? No less than the Meritage or the County office buildings, one would assume. Will the current traffic jam at the entrance to the airport, made that much worse by one more huge project up the road, be discussed? Probably not. The Napa City Planning Commission seems to have focused on the uninspired architecture floating in a sea of cars. One always hopes for good urban design, but the other chain-tenant shopping plazas and car dealerships they have approved on Soscol don't offer much guidance to the designers. What was not discussed, apparently, was the impact of another few hundred vehicles coming and going each day (not to mention concerns about housing the project’s workers) in this increasingly bottlenecked area of the county, once again highlighting the way in which the municipalities' development lust ignores impacts down the road (literally). The junction between Hwy 29 and Hwy 12 has become ground zero in the carrying capacity of Napa County, with traffic congestion at the top of everyone's negative list about the county. The fact that both visitors and workers are turned off by the commute is a good thing for those of us wishing to slow the urban development currently happening up valley. And that attitude seems to be taking hold in the county as well. The Napa Valley Transportation Authority recently decided against enlarging Hwy 29 at the junction. Building transport infrastructure just induces more development to fill the increased capacity, the reasoning goes. The theory, though perhaps not expressed directly at the meeting, is that you can control urban development just by making it impossible to get to the development sites. That theory was at the heart of the decision in the 1970's to stop building freeways in Napa county beyond the one small stretch through Napa City. These projects will add tens of thousands of vehicle trips per day to the traffic already there. The gridlock distances and hours will continue to expand. The legal problem is that all of the developers already with approvals are now expecting government to insure that people can get to their projects, and they will exert a lot of pressure. And the municipalities, concerned as always only with economic expansion and no concern about the urbanizing pressure their developments exert on the unincorporated county, have no interest in limiting access. Even residents who see the value of preserving what is left of unurbanized Napa will not tolerate an hour to get through the junction for long. And, because these are state highways, Caltrans will be forced to do something. The county's desire to disincentivize urban growth by limiting access will be forced to mitigate the traffic they have already sanctioned before they can implement a restriction plan - or be sued. The road will have to be widened to 6 lanes and the Soscol flyover built. Napa residents and state residents will have to come up with the money to do it. But what happens after that? Once built the increased access will induce more development. And so on. Controlling urban growth by limiting access is only half of the solution needed. The other must be to stop granting use permits and building permits, based on the unacceptable impact they will have to the access needed for businesses already in existence and those already approved. Unfortunately, since the Marriott is within the city's southern gerrymander, little can be done. But if the county is serious in their access restricting strategy, then the next step beyond saying no to infrastructure projects is to start saying no to new development throughout the county. It is either that or to begin making plans for the Hwy 12 and 29 freeways that will inevitably be necessary. At every planning hearing, government officials and some residents have stars in their eyes over the tax revenues and fees projects are expected to bring. It is only years later that the real cost of those approvals are known. The widening of Hwy 29 and the Soscol flyover will cost about $150 million - just one of numerous infrastructure and service costs taxpayers must bear to insure that developers can make profitable investments. "Development doesn't pay for itself. It doesn't." Volker Eisele is sorely missed.